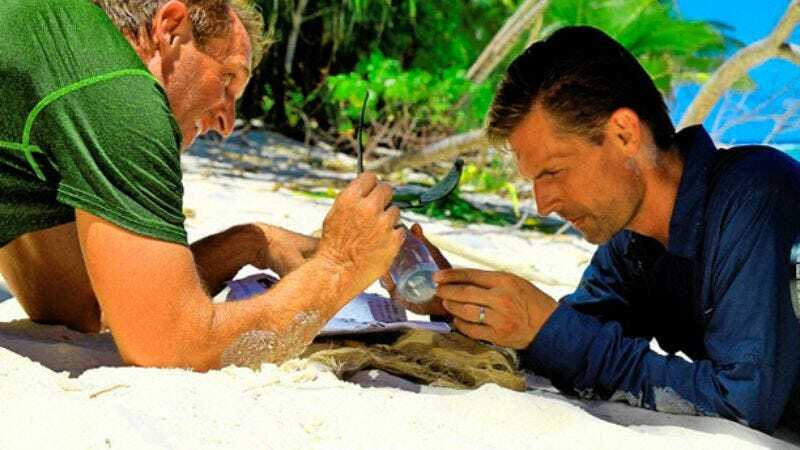 In what is basically the televised equivalent of a team-building retreat, the Discovery Channel is working on a plan to solve our nation’s political crisis, Survivor-style, by putting a Democratic and a Republican senator on a desert island, then filming them for six days. There, after enduring hardships unknown inside the Beltway, these two political opponents will come to see that they really do have a lot in common—for example, a predilection for accepting large sums of money from the industries they’re supposed to be regulating. The result is called Rival Survival, and premieres October 29 at 10 p.m. ET. The lucky, soon-to-be-lost lawmakers will be conservative Sen. Jeff Flake (R-Arizona) and liberal Sen. Martin Heinrich (D-New Mexico), neither of who are up for reelection, of course. Entertainment Weekly says the senators actually pitched the show to Discovery themselves, and not the other way around, presumably because they got bored with the partisan gridlock in Washington and figured they might as well make a mockery of the legislative process somewhere else for a while. The real surprise is that Discovery agreed to do the series, considering that Congress is currently less popular than Jar Jar Binks, and that can’t be good for ratings.